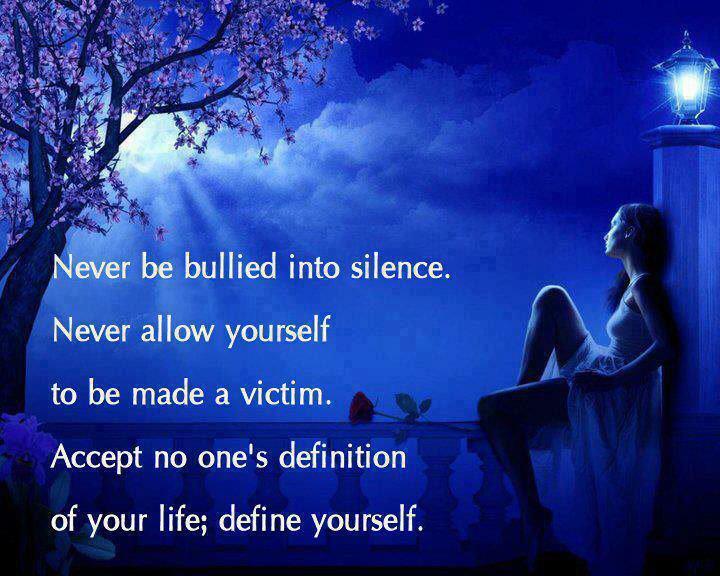 Never Be Bullied Into Silence. Speak Up About Abuse! When dealing with a high-conflict person, DOCUMENT EVERYTHING. Keep e-mails, make records, and toss none of it. You may need it later, not just to prove your claims of abuse, but because abusers will try to gaslight you into thinking you’re crazy and it didn’t happen the way you said. It also protects you from going back into an abusive situation, because our memories often will begin fading, until we start thinking it wasn’t as bad as all that. It happens to me on occasion, then I go through my accounts again and remember, to steel myself. I recall feeling a crisis, going back and forth for a few weeks about whether or not I should call CPS about my abuser Tracy smacking her child in the back of the head, right after I saw her do it–and whether I should’ve called the police right when it happened, and yelled at her to stop. I agonized over it, felt I was betraying the child if I didn’t, felt I was betraying Tracy if I did. The crisis only stopped when mutual friend Chris unwittingly brought up the subject and I had the chance to say that was abuse. Then Chris posted something on Facebook that gave me a chance to say what’s abusive. This is in my accounts, which also describe the other things I witnessed Tracy doing. But I couldn’t help feeling a huge crisis at being friends with an abuser and not reporting her. It worked like acid on my conscience. I’d breathe a sigh of relief whenever I’d get through a whole visit without witnessing her even verbally abusing the kids or snapping at Richard. In February 2011, after seeing The Boondock Saints for a second time and hearing the theme of evil winning because good men do nothing, I decided it was time to be an angel to those children, before something terrible happened–and tell somebody about the violence between Richard and Tracy, before somebody got killed. I had no idea, since it was not yet published online, that Richard had already strangled one of his children until she passed out. I sent an e-mail to a friend in social work in the state, describing everything I witnessed and knew. I wanted to make sure it all qualified as reportable abuse. She begged me to report them, saying that she grew up in a house like that and it caused lasting damage, that Richard and Tracy both sounded very abusive, and that I should do it to help my friend, Richard. My pastor friend had also begged me, back in 2010, to report them, because he used to work in a domestic violence shelter. Coincidentally, I mailed my report–a 3-page letter–the same day that Richard was officially charged. Right there is proof that I did the right thing, that my instincts were correct. My conscience is now clear. I also have various e-mails and drafts of e-mails written in December 2007 and very early 2008, which describe things I witnessed, and specifically refer to Tracy’s behavior to Richard and the children as abuse, and her treatment of me as bullying and abuse. They also prove that I was having just as much trouble in the late winter/early spring 2008 dealing with how she had treated me and others, as I’m having now, that I was just as angry with her then as now, even while we were still all friends, that this is not just a reaction to how she treated me in 2010, or brought on by researching abuse in 2010-12. No, I am in the exact same frame as mind now as then, about what she was doing. The abuse in that family began long before they came to my house. I also have a disturbing and shocking e-mail received in 2009 which proves it, and notes written on it by me which describe feeling gaslit until I got this e-mail, also giving more frightening information given to me over the phone the following day. The list, the e-mails, and the letter in my previous post–written to Richard but never sent because it felt too dangerous because of Tracy’s restrictions on his communication with me–all confirm my web accounts and blogs to be my actual impressions at the time of what was going on. They all confirm that I remember things as they happened. They all confirm that I felt abused, and felt I was witnessing abuse, that this was not at all something that later crept in to my head to make me feel justified in ending the friendship. No, we ended the friendship in 2010 precisely because of the abuse; this was not some story invented later. They confirm that my claims of abuse came from a combination of observation and the victim’s own words. They all confirm and back up the story that I have told as being factual to the best of my knowledge. That no, the issue was not, as Tracy claimed, me “snubbing” her or needing to “grow up” and accept her venom as my due, stop feeling hurt over it. Another issue was that Richard was in exactly the same place with Chris’ wife, as I was with Tracy, and I even told him so, yet he never seemed to make the connection and show me compassion because of it. No, the real issue was the way she abused me and others and got Richard to go along with it. She made it very clear that we could only come back to them once I stopped “feeling hurt” over her abuse. She made it very clear that she would accept nothing less than me submitting to all her abuse and venom as my due. Which is never, ever going to happen, and proved to me without a shadow of a doubt that she is evil, that I do not want to be friends with her ever again. My husband would get very angry if I did submit to her, and says that she has to get down on her knees and apologize to me for what she’s done to me. Only an abuser would require you to accept abuse without complaint. “Growing up” means controlling yourself and getting the facts, not raging at and abusing your friends like a toddler throwing a tantrum. A normal, healthy person would apologize for blowing up at you, and agree to a civil conversation, with give-and-take. Whenever I start doubting my memories and impressions, I need only remember that e-mail–and re-read all my documentation. And then I see that all her opinions of me are sewer sludge–and worth just as much. Consistent with narcissism and other cluster B personality disorders is the need for constant drama from which the N personality derives attention. For my mother, this was manifested in her constant need to be at war with someone. For years it was her sister, then various friends, my father, several coworkers, and eventually, her children. She was in constant need of worship, consolation, pity, or some other form of manipulated obligation from those close to her. For everyone else, appearances were everything. On the surface, she worked diligently to keep up with the façade that we were the “perfect family”. For my father, the cluster B’s were manifested through his enabling of my mother’s unhealthy bouts of behavior. While I do not believe he actually suffers from one of these disorders, he was extremely afraid of my mother’s reactions and reinforced her maladaptive traits as a result. He would rage at us kids if he felt the threat of one of her tantrums looming. He became intolerant of noncompliance and the voicing of opinions that did not cater to my mother’s disorder. He buried himself in work and checked out when it became evident that an avalanche of torrent was coming and showed up in the aftermath to make sure we didn’t rock the boat any further. In high school, I did not tell my teachers about the boys who sexually harassed me. I did not tell my parents, even though I began to get an ulcer. In college, I told no one how my fiancé Phil was treating me, though people did notice some of it and hated him for it. I will be silent no longer, will not even be bullied into silence by my blog stalkers. I stood up for the truth and for what’s right. I was an angel for those children. I’m standing up for abuse victims everywhere. Every day I get stronger as I continue to tell my story.